A long length, dense, plain fur throw in a beautiful soft baby blue colour. Perfect for bedrooms and childrens rooms, or pastel colour schemes. A lustrous shiny black, plain, long-haired fur throw. A dense undercoat coupled with longer black hair. Our usual range of 9 standard sizes or contact us for bespoke sizes. A rich brown fur throw with a dense undercoat and longer, darker, brown hairs. 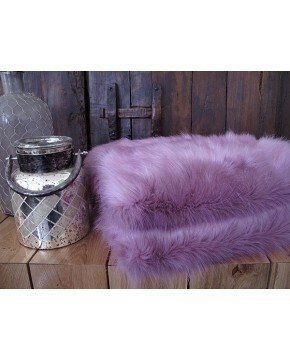 A superb quality faux fur which can be used independently or in conjunction with contrasting cream or beige cushions. A long length, dense, plain fur throw in a beautiful soft baby salmon-pink. Perfect for bedrooms and childrens rooms, or pastel colour schemes. A long-haired, slightly off-white, soft, fur throw. Made up of varying lengths of hairs. Superb quality, suitable for most colour schemes. 9 standard sizes available, together with a choice of 3 backings. Also bespoke sizes produced. Matching cushions available. A striking grey fur throw interspersed with long black hairs. A dense and warm undercoat. This fur makes a real design statement and will fit into almost any room. A long haired, soft dense fur throw in beautiful gold and wheat colouring with brown tipped hairs. Quality and luxury at an affordable price.